Britain's financial watchdog has launched a crackdown on high-cost credit as part of efforts to protect vulnerable consumers. More must be done to protect vulnerable people from high-interest debt a cycle of financial troubles, says South Shields Mp Emma Lewell-Buck. Mrs Lewell-Buck was speaking following the launch of a crackdown on high-cost credit. It is being made by the Finance Conduct Authority (FCA) in a bid to shield those most likely to find themselves in difficulty through overdraft charges, rent-to-own deals, doorstep lenders, store cards and catalogue shopping. High-interest credit is said to be used by three million people in the UK - with single parents aged 18 to 34 more likely to use payday, doorstep or pawnbroking loans than the national average. 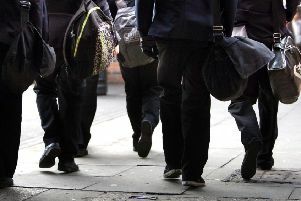 Mrs Lewell-Buck has said the changes are move in the right direction, but more action is needed. She said: “These reforms are welcome as a step to helping those struggling to keep their heads above water. Too many are having to rely on borrowing just to get to the end of the month, and are facing huge costs from our high street banks. “We bailed out the banks, yet they are now profiting from the most vulnerable in our society. “Too many are having to rely on borrowing just to get to the end of the month, and are facing huge costs from our high street banks. “But these reforms don’t go far enough. “Labour would cap the total amount that can be charged in overdraft fees or interest payments so that no borrower using an overdraft will ever pay back more in interest or charges than they have initially borrowed. The FCA estimates banks made an estimated £2.3 billion in revenue from overdraft charges in 2016. In the home collected credit market, the watchdog is introducing requirements which will prevent firms from offering new loans or refinancing during visits without a customer request. In catalogue credit and store cards, the FCA will ask firms to do more to help customers avoid persistent debt. The FCA is also considering imposing a cap on rent-to-own merchants after finding costs can be exceptionally high. It cited examples of people having paid over £1,500 for an electric cooker which could be bought on the high street for less than £300.